SPA procedures, massage and aromatherapy are very pleasurable ways of relaxation, but also they are some kind of luxury. The website of a relaxation salon can't afford to be simple or boring. Balance multipage HTML template is an ideal solution for a beauty salon. Marvellous animated slider with big and sharp photos focus visitors on relaxation from the first sight. A big number of additional pages allow you to build the site of your dream without any issues. Navigation is easy and your customers will always find the service they want to buy. All the eye-catching stock photos you see in the demo are included to the template pack and you are free to use them anywhere. Implementing this sort of framework drastically enhances the whole process of constructing web pages. Common styles are really simple to transform, that offers a versatile and easy procedure for building website themes. Responsive webpage design technique makes a web page's interface variable to any kind of screen resolution. Responsive website design allows you to get good buyer experience and provide a entire access to the web page information from any gadget. Search engine friendly digital products are optimized as per the present day SEO specifications. It increases the possibility they will be seen on the internet, consequently increasing your online site's ranking positions in internet search engine. The Search Engine Friendly template is really a fantastic general platform to begin marketing and advertising and boosting search rates of the webpage. It's more convenient to deal with such a webpage for Search engine optimisation expert merely because part of the work is previously done. Any time a person wants you to provide him with your service he tends to make an appointment. A specific appointment booking tool makes it to register a request for the customer and helps to customize the booking form for the website owner. Customers of your internet page will be able to pick and book an event online (for example seeing a health specialist). The extension is very good for business internet sites. It's a exceptional method when the background picture moves more slowly in perspective than the parts of the foreground. Because of this, Parallax generates a sensation of a three-dimensional space. Parallax enable your site visitors connect with your web page and gain far better customer experience. It helps you to stand out among your opponents. With Bootstrap 4, you're able to put together 100percent responsive web sites that will give the internet users with the greatest searching practical experience no matter what gadgets they prefer to reach webpage. How many applications, programs etc can I use to integrate with the Massage Studio website designs under one extended license? The extended license gives you the right to use the purchased Massage Studio website designs for the integration with one software/freeware/application/CMS/sitebuilder only. In case you would like to use the template with the other application, the other license is to be acquired. Can I apply a discount code to a discounted website design for Tanning Salon Lotions or combine several discount codes together to get better price? Can I put a line at the bottom (or any other spot) of my new product Website development by Company name after purchasing web template for Massage Salon Supplier ? Yes, you can place a note at the bottom (or any other spot) of my product Website development by Company name. Nevertheless, you cannot place Website design by Company name while using one of web template for Massage Salon Supplier . Is it possible to use your Beauty Blog web templates to develop websites for my customers? Yes. It is perfect for designers who want to offer their customers a high-quality design and also save time and money. Keep in mind that when you purchase the web template for Portable Sauna with ordinary or exclusive license you're entitled to create only one project (one domain name). Can I resell Cosmetics Department Store web templates I bought the developers license for? You cannot resell the customized web template for Beauty Blog as a template, but you may sell it as a project to your client. Can I customize the Fashion & Beauty News website design template if that's required by application settings? Yes, you can customize the Fashion & Beauty News website design template code, graphics, fonts to any extent needed. I would like to make payment for website template for Sauna by company check. Is that possible? Please use Skrill payment option. They accept payments by check.You can place an order for website template for Sauna on the site under the name of the company and choose Skrill merchant system for making payment from the company's account. To initiate bank transfer, please create an account here - www.skrill.com, add the number of your bank account and verify it. After that, you can place an order on our website and choose Skrill on checkout page. When the payment is made, the product will be sent to your e-mail along with the invoice under the name of your company. Are there any restrictions for using imagery, cliparts and fonts from the web template for Massage Salon Supplier I purchased? All imagery, clipart and fonts used in web template for Massage Salon Supplier are royalty-free, if not stated otherwise on the product page, and are the integral part of our products. One Time Usage License and Developers License give you the right to use images, clipart and fonts only as a part of the website you build using your template. You can use imagery, clipart and fonts to develop one project only. Any kind of separate usage or distribution is strictly prohibited. Can I customize the Massage Salon website design? Yes, you can customize the Massage Salon website design to any extent needed. You cannot use a header of the template for one project though, and images from the template for the other project. 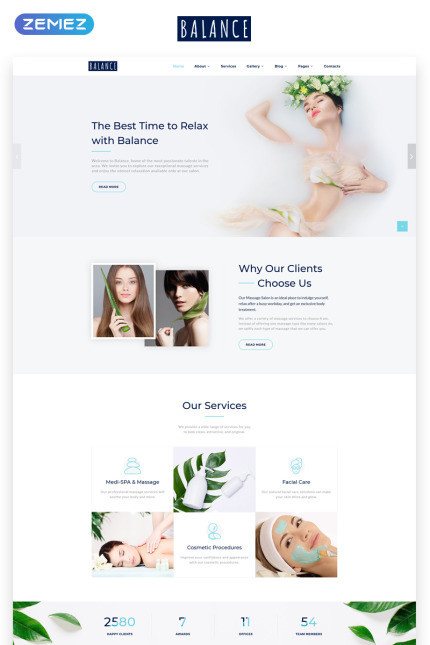 I have customized the website template for Beauty Salon and would like to protect my content by copyright, can I place Copyright, Mycompanyname.com? After website template for Beauty Salon purchase you can put your copyright to the template. But you cannot place a line at the bottom (or any other spot) of the customized project saying Website design by Company name. Nevertheless, you can place Customized by Company name. How can I modify web template for Massage Studio to suit my particular website? Please visit our Online Help Center to obtain detailed instructions on editing web template for Massage Studio. Are there any limitations on selling the website design template for Massage Salon Equipment Shop as the integral part of my new product? What is a one time usage license for a Sauna Room web template? When you buy the Sauna Room web template at usual price you automatically get the one time usage license. It enables you to use each individual product on a single website only, belonging to either you or your client. You have to purchase the same template again if you plan to use the same design in connection with another or other projects. When passing files to your client please delete the template files from your computer. What is the price for acquiring the extended license for Beauty Salon Spa web template? There is no set price for acquiring the extended license. The price is based on the Beauty Salon Spa web template's unique price for those templates you would like to use for the integration. The price for purchasing license for a single template is half of the template unique price. Are your web templates for Spa Supply Storecompatible with any CMS? Can I put a line at the bottom ( or any other spot) of the customized website design template for Massage Salon Equipment Store Website design by Company name? No, you cannot place a line at the bottom ( or any other spot) of the customized website design template for Massage Salon Equipment Store saying Website design by Company name. Nevertheless, you can place Customized by Company name. Do you provide any scripts with your website design templates for Spray Tanning Salon or could you do some custom programming? Our templates do not include any additional scripts. Newsletter subscriptions, search fields, forums, image galleries (in HTML versions of Flash products) are inactive. Basic scripts can be easily added to a website design for Fashion Beauty at www.TemplateTuning.com If you are not sure that the element you're interested in is active please contact our Support Chat for clarification. I would like to purchase website design template for Beach Tanning Studio , but it is not available on the site anymore. The website design template for Beach Tanning Studio has been sold out for exclusive price or discontinued.As technology inevitably develops, TemplateMonster may discontinue the production of certain products. It can be no longer available for sale because of being outdated. Can I use graphics from website design template for Salon I purchased for use in printing? Yes, it's not prohibited to use the website design template for Salon graphics for printed material, but the resolution of the templates graphics ( except for logo templates) is not enough for printing. Can I get the Sauna Kit web template in higher resolution to use for printing? No, we design Beauty website design templates optimized for web resolution only. Will you help me to customize my website design template for Tanning Booth? We do not provide any help or instructions on website design template for Tanning Booth customization except for www.template-help.com help center. If you are not sure you can customize the template yourself we recommend to hire a design studio to customize the template for you. What is Developers License for website design template for Sun Tanning Bed ? If you purchase a Developer's license, you are granted a non-exclusive permission to use the website design template for Sun Tanning Bed on up to 5 domains for projects belonging to either you or your client. Can I contact the Fashion web template author? Yes. You can contact this Fashion web template author/author's team directly using your personal account under the Support tab.